Used to be when a man wanted to get churched up he’d visit the local pharmacy. Cop some honest groomin’ products. Nowadays said pharmacy visit turns up mostly potato chips. And Gatorade. And copies of US Magazine. Get back to the old school at Northern Grade Pharmacy, a pop-up of quality man maintenance goods opening tomorrow at The Dossier Outpost. N.G.P.’s your one-stop for stuff you can’t find at Duane Reade. 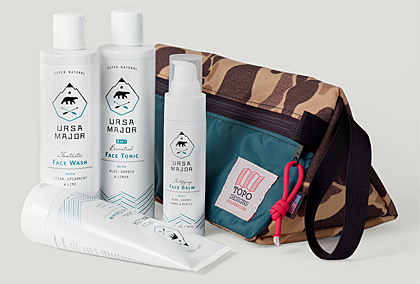 Companies like Vermont’s Ursa Major, whose Big Kahuna Skin Care Set is basically everything you need to keep yer ugly mug smelling fresh and looking line-free. Or Portland’s Maak Lab, maker of natural soap bars infused with coffee and beachwood. Or Portland General Store, who know that a true fella’s cologne oughta smell like whiskey. Or tobacco. Or saltwater. Plus a host of merchants hawking stuff like duck canvas briefcases, buffalo leather wallets and more. If only every pharmacy these days could have you looking so good. Nota bene: Dossier also boasts food trucks galore and a temp shop of NY surf gear that lightened this correspondent’s wallet significantly. Don’t miss ‘em.